This build is one of my own. It’s a revision of my portable computer named Ace. Yes, the one when I had no particular name until a year later. Technically the first version was built on December 1, 2014 while this second (wait, third...) revision is base upon my last time working on it. The purpose is mostly the same which is surf the internet, Netflix, Amazon Prime videos, watch DVD movies and favorite TV series, and some old games. I’ve also been testing games that are more recent. Frankly today, I wouldn’t suggest this spec of a build to anyone. I did this for fun and I wanted to see how the Athlon 5350 would perform. I’ve been surprised with some games being able to play and not surprised for games that struggled. I wouldn’t suggest the AM1 for MMOs and other games that require a decent processor. Unless you can overclock this particular APU very well (2.4GHz~2.6GHz) with an ASRock or ASUS motherboard than you might be surprised with some games just don’t expect too much. Some of my images are screenshots and my cellphone. A friend of mine needed to borrow my Nikon D5100 camera for a few days, though the majority of the photos are from my D5100. So I used my cellphone for a moment which is obvious... I cannot say I’m great with a cellphone camera as I’m inexperience with the settings and lighting control so please forgive me. Only had my cellphone for a couple of months because my previous one had a bleeding LED thanks to my clumsiness. It’s quite a change for me despite how odd and hypocritical it sounds which next time I should play with the camera a bit more. Photo numbers 1-15 is the final result. After #15 is the building process and extra photos. Originally I had used my APU’s graphics Radeon R3 for a while until now. The GPU was bought used from Amazon with no original box, but safely packed with bubbles in a box that came with EVGA’s stickers, manual, and the DVD disc though I used NVIDIA’s and MSI’s websites to download on what I needed. 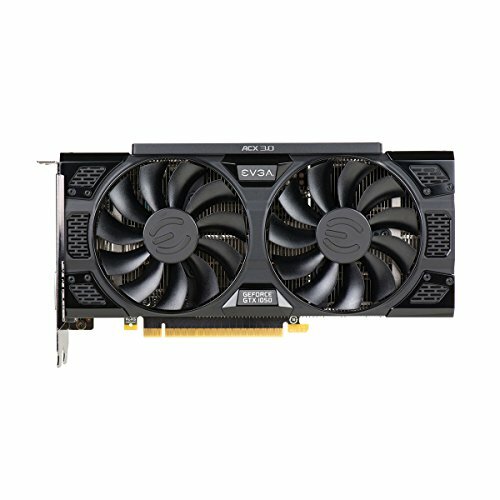 This card is light weight and performs better when comparing EVGA’s GTX 750 Ti FTW. 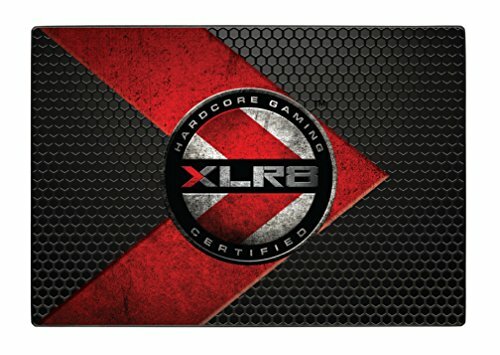 I didn’t see myself pairing my AMD 5350 with a high end card. Despite the minimal lag will occur and it’s to be expected yet it can game. Not the most ideal gaming rig nor would I recommend this today. I been able to play a few games that look good or decent. I normally can play a mix of Low and Medium settings (sometimes High or Ultra too, but varies) with reasonable FPS at 1080p. I try my best to not let a game stay below 25 FPS because that’s as much fun as watching wall paper dry… Otherwise, the games that are playable have been performing successfully. 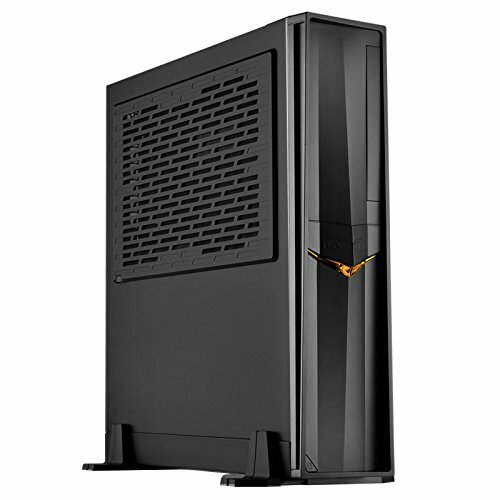 Of course paired with the Athlon 5350, 720p is the best for gaming to achieve a mix of High and Ultra settings. I do recommend this GPU for those who are on a very tight budget and the bonus is no 6-pin connector needed. Realistically in the present, pair the GTX 1050 with the Pentium G4560 or the Pentium G4600 to make a starter build. Wow, what a ride! I bought this new and was in awe. Quite tall in height yet fun to work in and maybe I’m a sucker for building in small forms… Anyways, I followed the instructions from the manual which was simple and vague at times; however, it wasn’t difficult to learn about the case. Ten minutes reading the instructions and the total accumulation of time to rebuild my AM1 was 2 hours. Base upon my experience, this was an easy case to cable manage. The front panel cables are already sleeved which makes them look lovely and the 3.0 USB cable is best to route around the tool-less 2.5” storage area unless your connector is somewhere else. HD Audio was a breeze to install and same for the 2.0 USB. Plenty of holes to route cables yet this varies upon the motherboard layout. Installing the SSD and optical drive is tool-less, though later on I had to relocate my SSD closely to the optical due to wire management was cleaner and less strain for connections. The PSU clip was easy installation once the PSU was installed securely, just don’t forget to set the PSU ON ( | ) or you’ll have to take the side panel off again. The PCIE Riser, PCIE Expansion Slot, and Graphics Card Holder Bracket (AKA brace) comes with the case which is awesome and helps greatly. The feet is also nice to have since I’ll have my case stand vertical for now. The screws were straightforward because there are only two types. (I-632-5-BK screws x16) The flat screws is to install the Motherboard (4), Power Supply (3), PSU Clip (2), PCIE Riser (2), Card Holder Bracket (1), and a 3.5” HDD (4). (PW-M3-4-BK screws x4) The slightly bulky screws are for the 2.5” HDD, it’s not for the rest of the components. The shape of the case is cool looking and the external orange LED gives it a nice touch. Though the tool-less objects and panels are made of plastic so be gentle with them. Overall, I was very pleased to work on this case. I don’t regret buying this passive RVZ02B to replace my previous Apevia case. One last note to mention, the case is very easy to carry around. I’ve been guilty relocating the computer in many areas. Definitely not the fanciest PSU, but it functions well. I had no issues with the fan as some had experience and I haven’t seen this go beyond 120w when I game so I’ve been OK so far. Of course, it’s a No Modular so I did the best I could to wrap the wires around the case. I did re-purpose the velcro strap that came with the PSU to bind together unused wires. More importantly this was affordable and plentiful amount of wattage for my current uses. I don’t intend to add more components nor could I due to no more SATA connectors. This has a PCIE 6-pin already so you could definitely power the GTX 750 Ti FTW or the GTX 1050 FTW for certain. This was purchased quite a while ago in 2015. I can say its served its purpose and I've been happier to have this over the stockfan. Yes it’s audible, but if I was comparing between these two CPU coolers, I rather have this. Very similar RPM but it’s about 200 more RPM, up to 2,700 RPM; however, it doesn’t make that LOUD buzzing sound like the stockfan did. The cooling effect is almost the same, but a little better. I would have suggested this CPU cooler in the past when it used be around $14~$16. Today I suggest the ARCTIC Alpine M1 when working in restrictive height cases and it’s more quiet. For a case that isn’t restrictive in space than the ARCTIC Alpine M1, Passive Fanless. This was purchased in June 2016. Plenty of room and works pretty well. The boot is about 3~4 seconds when ready to login. Loading up Windows takes about 7 seconds. I wanted an SSD with more space for games that I’ll play often and some very old games. Its been used for a few computers until now it has a home. I have quite a few of these incase I had to work on motherboards that don’t have 3.0 USB connectors. 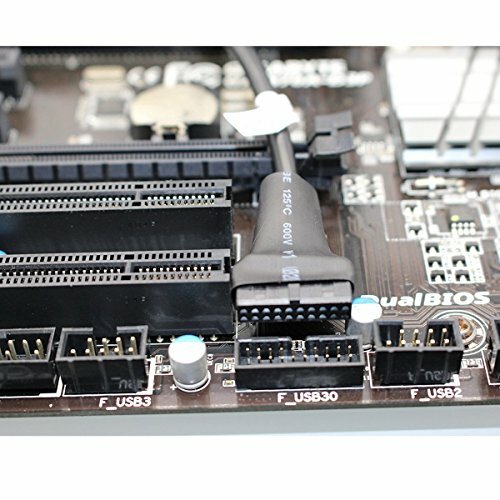 My AM1 motherboard didn’t have a 3.0 USB connector. Now I'm able to use my two front USB ports instead of being dormant. Having only two 2.0 and two 3.0 USB ports from the motherboard, this helps greatly to have additional two USB ports. An important tidbit to mention, certain devices such as a wireless keyboard, wireless mouse and flash drives do work. External storage will not be detected and therefor better off using the motherboard’s USB ports. This was my first AMD processor to build as a custom computer. It’s not a Pentium, but it’s plenty enough. I wouldn’t suggest this processor for a workstation, but for the basic, everyday uses it’s great. I don’t use Firefox as I notice it takes a little while to load a webpage. Google Chrome can be around 2~4 seconds. Works well with most games I have played. Do not use the AM1 for MMOs and other games that are very dependent on the processor. Most MOBAs will vary yet should run. I don’t have high expectations for this APU, but I’ve been surprised. Last to mention, this APU seems to work well with the GTX 750 Ti or GTX 1050 at 720p which you can get a range of High and Ultra with some tweaking of the settings. Keep VSync OFF unless not necessary. It works well and I’ve known it’s a basic motherboard with a simple BIOS. There are three versions of BIOS though mine remains 10.1. The layout may be different, but I didn’t have a difficult time to manage wires. I cannot really overclock the processor as I am only able to increase an additional 0.05GHz, thus 2.1GHz. 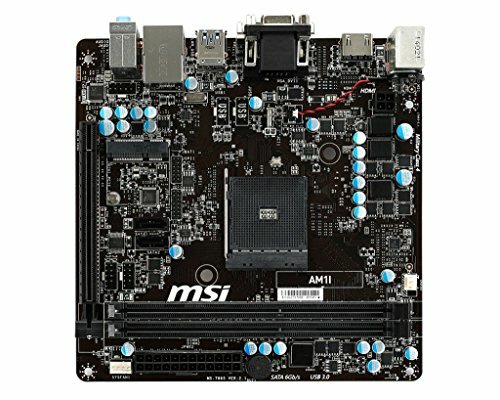 Otherwise, I’ve been content with this motherboard, but if someone was interested of an AM1 build for surfing the internet, Netflix/Amazon Prime Videos and Office purposes than get a motherboard that is ASRock or ASUS with a 3.0 USB connector. One of those two manufactures have better overclock probabilities for the AM1 processor. My first memory was purchased in 2014 and later on I purchased one more 4GB RAM in year 2015. I know the AM1 only functions as a single-channel, but it’s nice to have the extra 4GB for games like RE7, Rainbow Six Siege, Alien Isolation, and a few more come to mind. Again, I didn’t have to overclock these particular memory as they automatically are set to 1600MHz. Yes I will ever now and then watch a DVD movie or a TV series. Not a necessary requirement, but it works and does its main function. I also ripped some of my favorite songs. 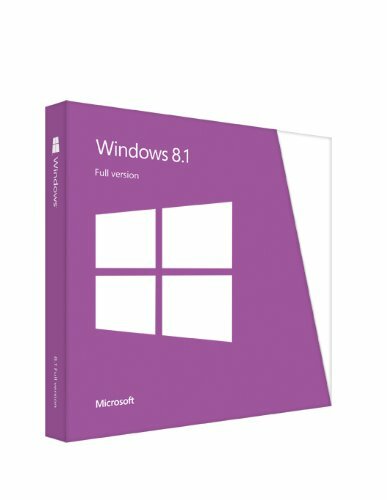 I had some major issue with Windows 8.1 after a clean install. My Windows Updates would not upload any window updates after letting it try for 24 hours. Many other attempts were 2 between 4 hours. Yes I relocated the computer to be close to the WiFi extender which is about 25 feet away from router below a floor and use an Ethernet cable. I certainly lost track after a few days of searching on the internet with many attempts not working to solve my issue. Since my Windows Update wasn’t working and I know it wasn’t the OS. A lightbulb went off when a comment suggested to repair the Windows Update Agent. Google searching and I found this on Microsoft’s website: Description of the Windows Update Troubleshooter. Scroll down a little and there is a button name “Fix It” for Windows 7 and Windows 8. Click the Fix It Button and download an application called WindowsUpdateDiagnostic. Assuming the internet is working and the application is in the “Download Folder”, double left-click the WindowsUpdateDiagnostic and click Next. After it detects problems than it will repair them pretty quick. I took a photo of what my errors were (#207). Once this was done I went back to the Windows Update and walla in less than 2 minutes the Windows Update Agent was working officially! I was able to upload and download my important Windows Updates for Windows 8.1. You may have noticed a different USB WiFi with my new components and case. I came to two problems, 1) blue screens when was login to Windows 8.1. 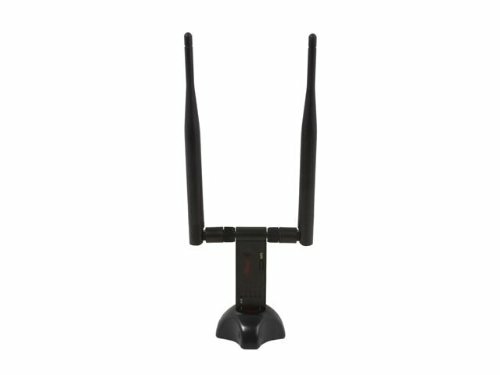 Oddly it functions normal like a plug and play when I installed and uninstall the WiFi driver 2) and not strong enough WiFi reception with this AC WiFi USB. I’m about 50 feet away from the WiFi Extender with three walls in the way. I’ll save the AC USB WiFi for a different build and stick with what continues to function well which is my Rosewill N250UBE USB. I’m not certain, but I don’t think these particular Rosewill WiFis are manufactured any longer. I’ll note it’s a plug and play friendly USB WiFi for Windows 8.1 and Windows 10. It’s not recommended to install the Rosewill driver as the Realtek driver works great to begin with. I’ve also been using a long Ethernet Cable if it’s on my desk. Again, I’ll use my WiFi whenever I need it. A must have for slim optical drives. I really love having this cable for my optical drive plus due to restriction in space. It’s very helpful to have this cable in compact cases. 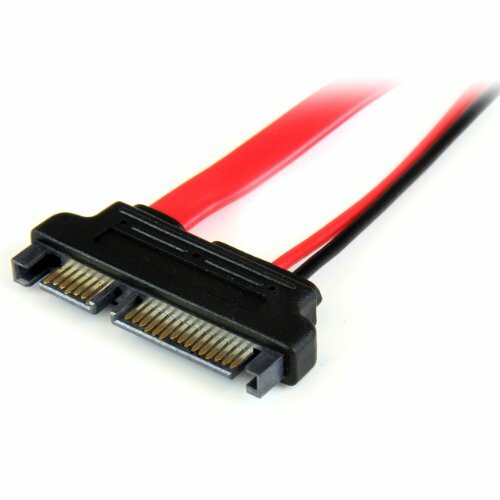 I’m certain Star Tech continues to sell these Slimline SATA to SATA cables. It’s trial and error with games running at 1080p except for some might easily be able to. Unless I’ve mistaken a game for being incapable at 1080p or if it lags too much. Obviously most can run higher graphics in 720p with some tweaking of the settings. Otherwise, thank you for reading my description. Please feel free to leave any comments, questions, and constructive criticism. I can explain something further for any question, correct any typos or if I forgot to mention something. Great write up, great pictures (as always). It looks like this computer is handling your needs. I love the case. Would you recommend this case? Thank you Mike, I truly appreciate your support and compliments. Yes it's an awesome passive case and quite addicting for me to carry around now. That may be due to my type of hardware makes it so light, even the case is light. I really had no problems working in this case, despite the instructions are vague, but it has everything you need right from the get go. Researching and choosing the appropriate parts for someone's intended purpose it can be a nice HTPC, gaming rig or a workstation. It might go up in temps though base upon the processor and GPU so a cool room will be a good idea for this particular case. I also like the case not taking too much space. So yes, I would recommend this case for certain. +1 for 220 pictures. Great write up, as always! In all honesty though everything is a 12/10 to me, description, photos, and the description is really well formatted and organized. That is a high compliment, thank you. Yes, I have quite a few 32GB SDHC cards. Hopefully I can buy those 64GB or 128GB versions down the road. A great build! I love it. +1 for great photos. I was literally playing life is strange right now. Thank you madnight! Your compliments is received gratefully. And that is awesome, I enjoy replaying Life is Strange every now and than. I hope you are enjoying it or enjoying it again! I also cannot wait for Life is Strange: Before the Storm as that will be available this year at August 31st. I see myself buying the game with DLC package. Anyways, thank you again for your support! Is it weird that, as soon as I start going through the pictures and I see how many there are, I immediately exit to check if it's an Eltech build? Lol It's all good. You know my patterns well. No shortage of pictures as usual. Surprised the 5350 is actually somewhat competent. Oh my, you know it. I'm loads of pictures. 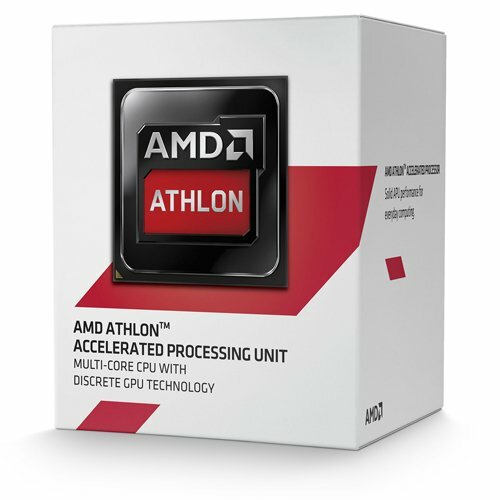 Yes, its been a surprising experience with the Athlon 5350. Thank you RasberryPi! That would be awesome if they do.